Used to increase scaffolding footprint for tower stability. Must be used when stacking 3 or more sections of scaffold. 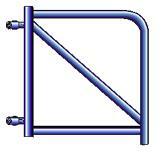 Can be used with scaffold wheels or base plates. * Please call us with any questions about our scaffold outrigger ea rentals in Oak Grove MO, Blue Springs MO, Independence MO, Lexington MO, Odessa MO, Independence MO and Western Missouri.